Info "Who IS that guy? Hit him in the head!" Off the Wall is one of WarioWatch's microgames in WarioWare: Twisted! The game's purpose is to aim for the man and shoot him with a ball. 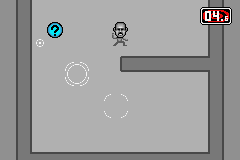 In some difficulty levels, the player needs to make it bounce on the wall to reach the guy. If he's hit, the game is won. However, if the player misses, they will lose the game. The player starts off the game with 5 seconds. 2nd level difficulty: There will be a bar in the ball's way. 3rd level difficulty: There will be two bars in the ball's way.